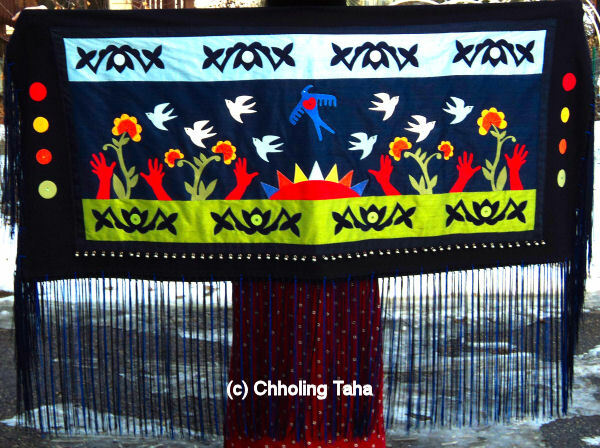 My beautiful wearing blankets and shawls are personally hand cut, designed, stitched and assembled by me. NO OUTSOURCING on any of my fine craft pieces. My textiles are not sewn or assembled in a foreign country or sweat shop. 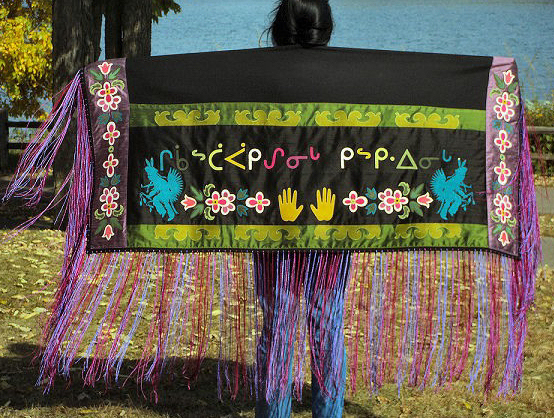 Blanket & Shawl Designs are Original Designs and Can Be Customized. 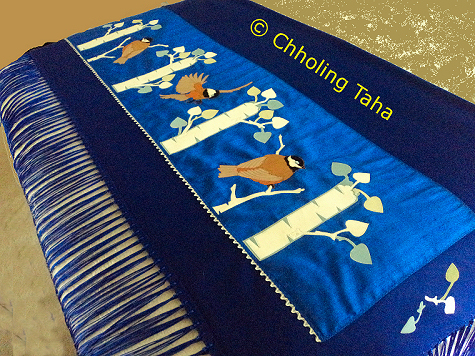 Blankets & Shawls are made of 100% fine wool fabrics, silk, satin, and Ultrasuede. Bone "Elk Teeth", Swarovski Crystals, and Other Ornaments. Fringes are all hand-cut, knotted and trimmed.
" Kohkom's Garden (Grandmother's) "
A stunning new shawl made of 100% new wool, silk, Ultrasuede (tm), baby rick rac, Swarovski crystals and had cut finges. 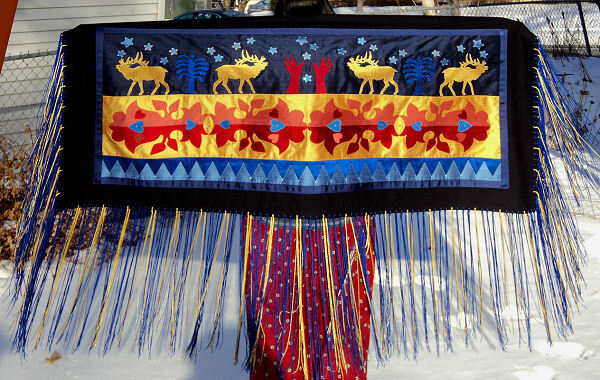 This beauty will be on dispay at the Wisconsin Quilt Musuen during the Native Fiber Show. 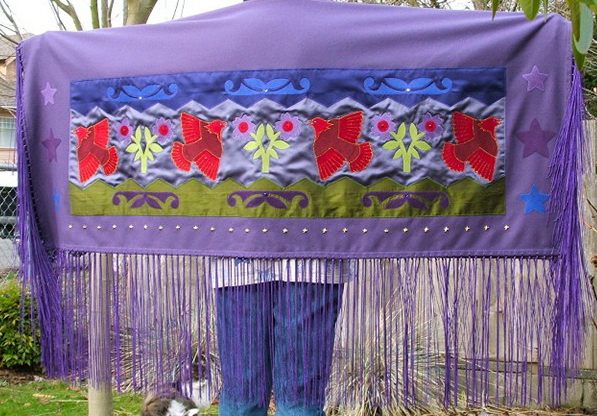 A lovely new shawl stitched and fringed with care. The fringing is 18" in length, royal blue and two canary yellows. The deep navy blue wool is from Italy. Background fabrics are 100% dupioni silk in ice blue, navy, royal, salmon and and deep red. 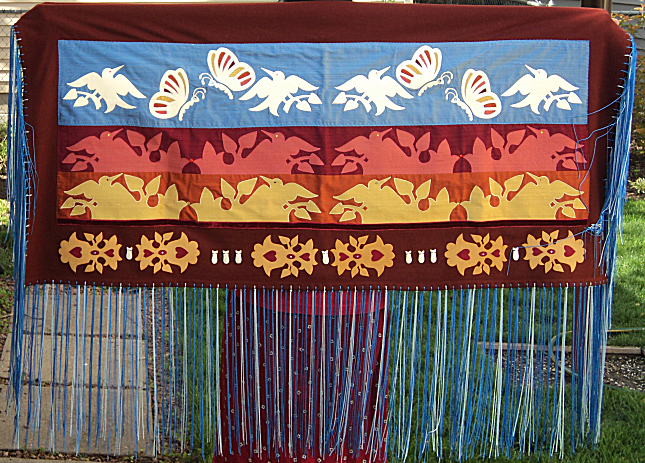 Size: approx: 63" x 28" (folded), 18" fringes. 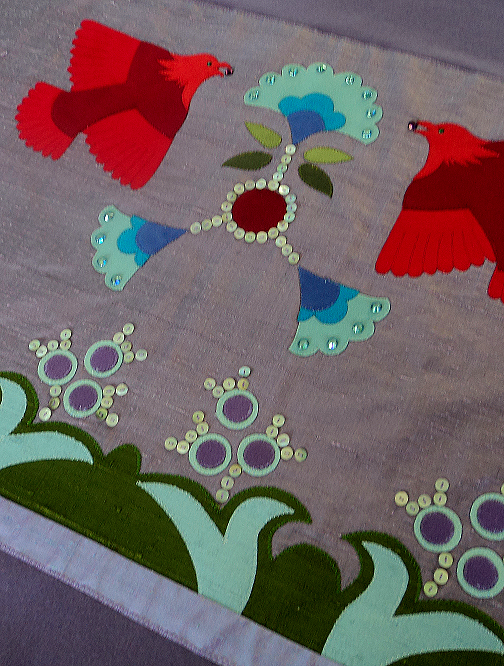 "Lost Birds Returning Shawl "
A lovely new shawl stitched and fringed with care. 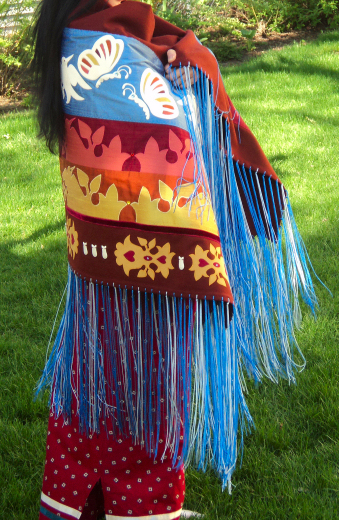 The fringing is 18" in length, navy blue and royal blue in color. The deep navy bluewool is from Italy. Background fabrics are 100% dupioni silk in ice blue, navy and acid green. A lovely new shawl stitched and fringed with care. 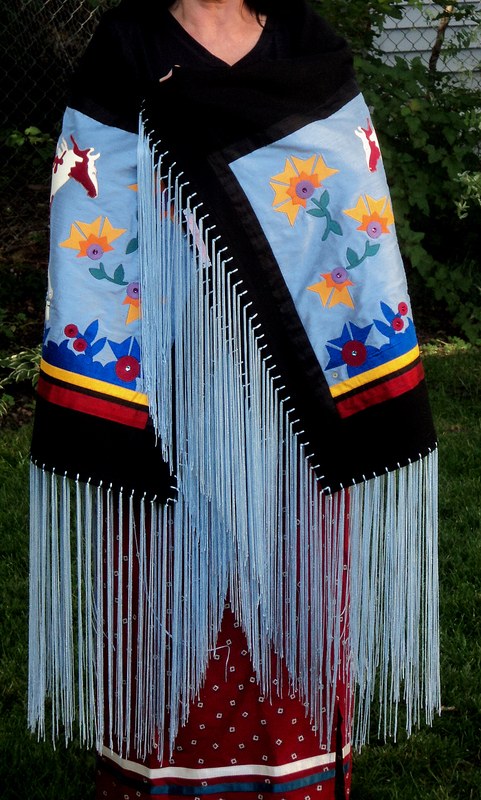 The fringing is 18" in length, orchid and sky blue color. The jet black wool is from Italy. Background fabrics are 100% dupioni silk in sky blue, burgandy, daffodil yellow. 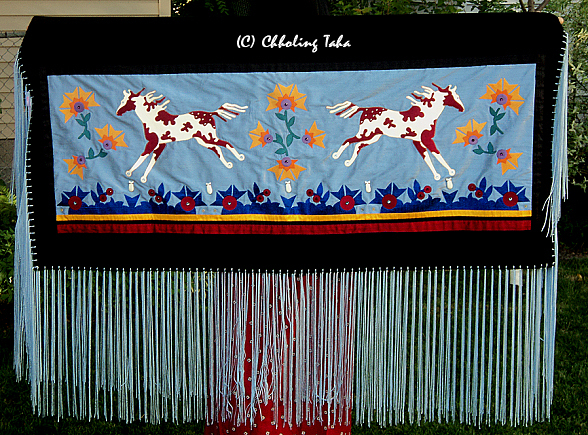 Size: approx: 61" x 28" (folded), 18" fringes. Price: $1195 (+ $20 shipping). 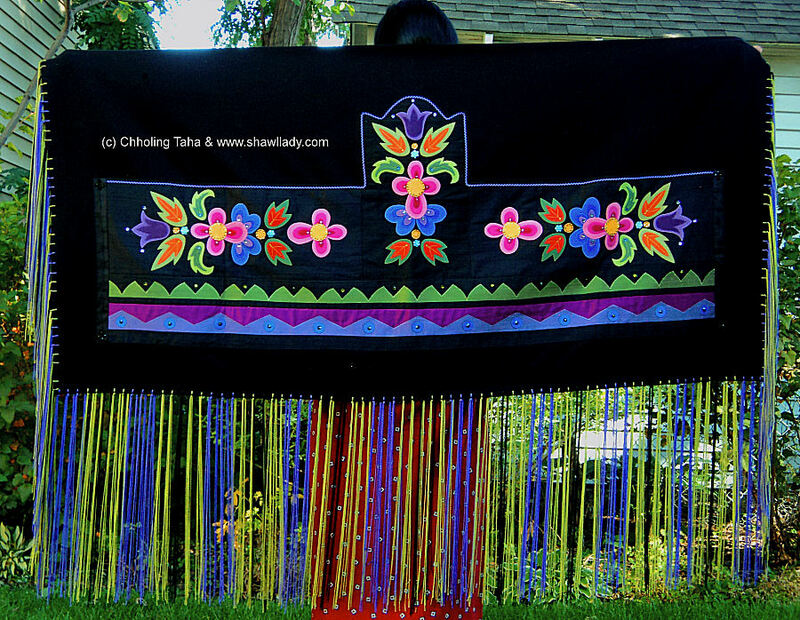 A lovely new shawl stitched and fringed with care. 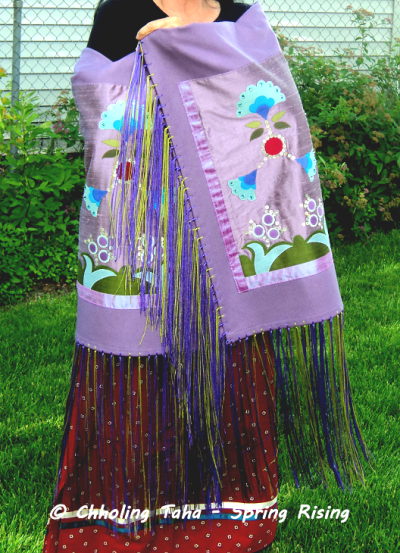 The fringing is 18" in length, orchid and acid green in color. Hundreds of hand stitched tiny natural shell buttons adorn the floral areas. The lavender wool is from Italy. 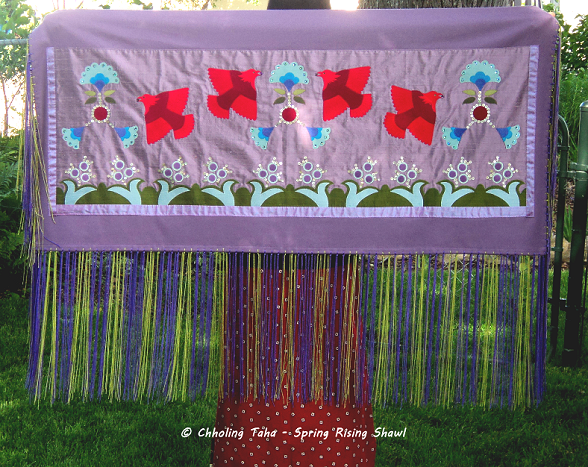 Background fabrics are 100% dupioni silk in lavender and acid green. 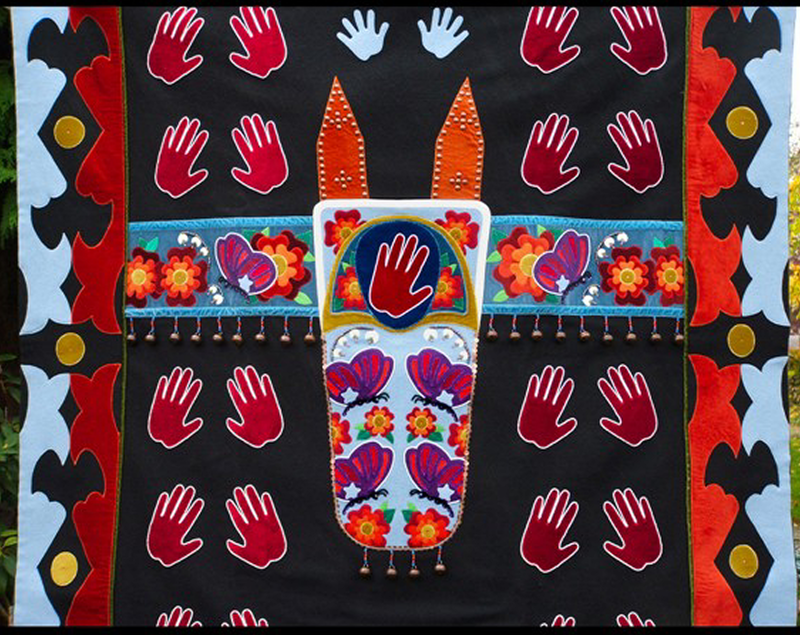 This lovely work of art consists of 100% new wool backing, 100% silk appliques, bone carved elk teeth, hand cut and tied fringes in two colors, and glass Swarovski crystals. Size is approx. 64" width, 30" (folded in half). All ready for the Ceremonial Season! 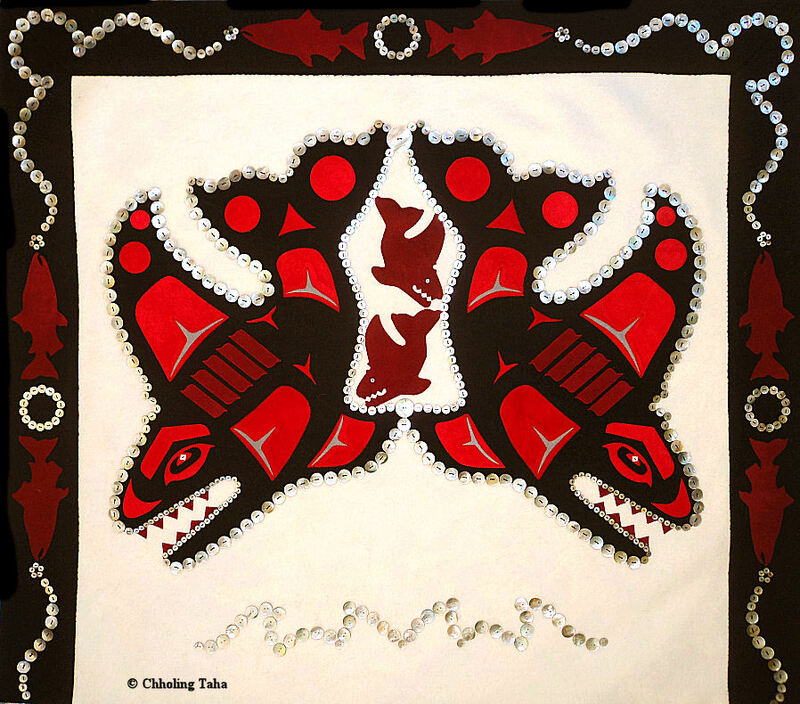 Many years ago I studied NW Coastal style art under Marvin Oliver while living in Seattle WA. 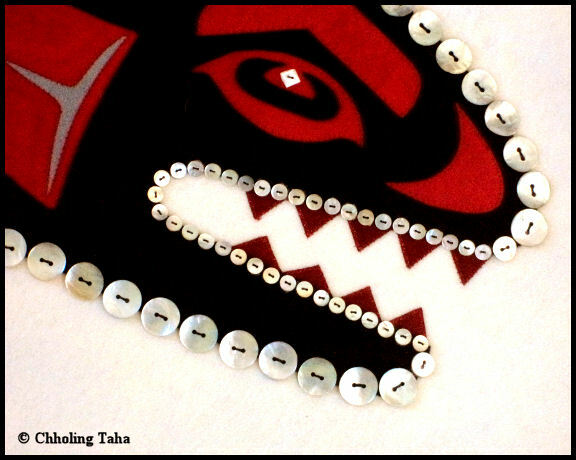 This wonderful Killer Whale family is of my own design based on NW Coastal style of art. This wall medallion (wall hanging) is approx. 42" x 37" and is sewn using heavy 100% wool melton. The buttons are all 100% natural shell and some are antiques. Shells are 1/8" ro 1 1/4" in size. Dark red salmons protecting their eggs migrate along the black borders. 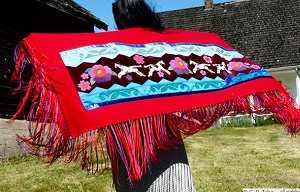 The borders represent the longhouse roof and sides, thus the bottom is left 'open'. There are approximately 600 natural shell buttons on this piece. Killer whales used with permission. 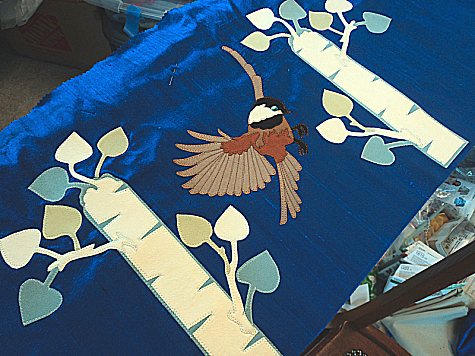 A sleeve for wall hanging using a rod is on the back. The back is fully lined with 100% cotton fabic for proctecting the stitching. Enjoy! PRICE: SOLD to a collector in Lakeside WA state. 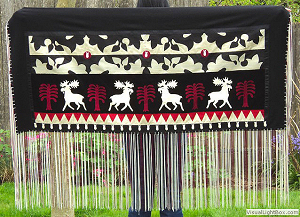 This gorgeous blanket is 60" x 60" made of blanket weight wool melton. All decorative items are appliques of various materials. 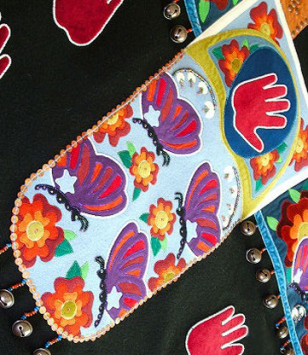 The hands are outlined in #9 3-cut seed beads in ivory. Hawk bells and copper sequins complete the design.